Discussion in 'Ranger Media' started by Shawn, Sep 25, 2012. Heated mirrors are done..Timer is from a Volvo. Auto shut off after 12 minutes. I used the rear defogger switch in the Explorer bezel for a factory installed look. I even wired up the in switch indicator. Next up is the heated washer nozzles and hose from a MB. Should be a good mod for your area. I am sssoooo far behind on mod. You truck is looking good, keep the mod coming. Info on heated mirrors? Were they just replacement glass with heated element or a universal retrofit kit? Links please and any other info please. I've fallen in love with heated mirrors in the tow trucks that I regularly drive in rainy and soggy Mt. Hood, Oregon. Thanks for any info. They are the glass replacements with directionals and heat. You need an H-mod Kit if you didn't have heated mirrors stock. Pricey but hoping for the best. I bought the stick on elements from fleabay. Measure and make sure these fit your glass. I took my mirror heads apart and installed them on the rear of the glass. I used a Volvo rear defroster relay timer. Part number 9148300 It auto shuts off in 12 minutes. I have an Explorer radio bezel and wired the timer relay to the existing rear defogger switch. You could find Explorer heated mirror glass and swap them on. They are expensive when compared to the $5.00 I spent on the universal elements. And another $5.00 on the timer. That’s a great idea and you can’t beat the price but I have the mirrors and the replacement glass units, just trying to find a minute in between everything else to get it done. Good Info for the site. Shawn... did you need to break the old mirror glass off the backing plate, apply the universal heating element onto a replacement "just glass", then install the combo onto the backing plate?? I can't imagine heat passing through the plastic backing plate and resulting in what your images show. Thanks for any help. The heating element pattern and size is what I was questioning in my head and lead me to believe they were add-on elements, not glass. If the modified mirrors were the result of the super expensive Muthco, I would have been greatly disappointed. I've located a different brand that is just a heated drop-in (no signals) with bracket for a really good price that I may take the chance on for my 06+ OE mirrors. But first I need to head to an old employer and look at the product first hand. I separated the glass from the backing plate using a 1" plastic putty knife. If I remember correctly, that's the tool I used. I applied the element and glued or taped the glass back onto the backing plate. I did not break the glass. I would have preferred to have a better, read larger, element but this is what I found for a good price. They do work nicely and I have VERY little invested. You , might consider it a kit but the mirrors are separate, the harness for the heater is separate and the mirror control is still Ford. It is piece meal, so to speak, but can be used with OEM harnessing. Thanks for the info, guys. If the modified mirrors were the result of the super expensive Muthco, I would have been greatly disappointed. Pricey but not super expensive, a god set of seat covers will cost more than that. I have seen the Muthco Units on an F150s, they work and the built in directional not only looks good but looks OEM. It's all good. I am just too cheap to spend that on the mirror glass. I did look at those and other heated/signal glass before I decided on the elements. I had experience with the stick on elements from working in a bus garage. I knew what to expect ahead of time. Actually the “H-Mod-Kit” is from Muth Co, when you buy their directional/heated mirrors glass and don’t have the wiring for the Heat then you need their H-Mod-Kit. I wanted the Directionals in the mirrors and didn’t like any of the mods I had seen, so I went for it. Yes pricey but I think I will like it when and if it ever gets installed. In my case, I didn't want the arrow signal indicator. I've never liked them and I LOVE my convex blind spot mirrors. And Muth doesn't offer them without. At least from what I could tell. Do the Muth mirrors come with the bracket? If so, I've never seen an aftermarket mirror assy with the stock shaped bracket/pivot panel that's like the OE ones. Stock shape is if you cut Nebraska in half and leaving the eastern half. Hard to explain but you can see the bracket shape in the Muth Co instructions. Have you seen mine? I wasn't too happy with anybody's signal mirror mods either on the 06+ mirrors. Except mine once I finally found the LED frequency I was looking for. lol. What LEDs did you end up using for the turn signals in the mirror? It looks decent enough but to me the blind spot mirror takes up too much of the mirror. The directional strip is a good idea though. 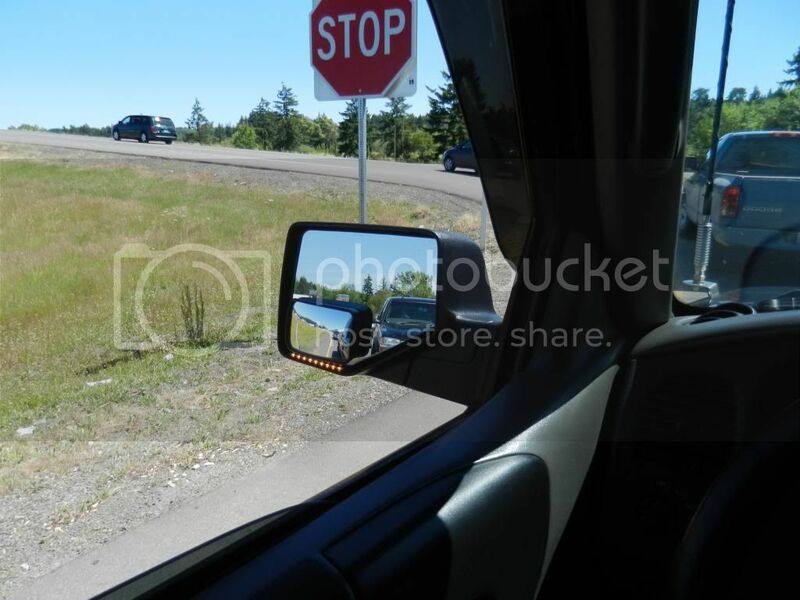 I have been looking at some add-on blind spot mirrors, they fit on the bottom of the mirrors where I would want them but so far all I can find are the ones with clips not a bolt on thing. Here is one on e-bay that I liked, will need to make a better mounting system. Next question would be how long will china chroming on plastic last ? Maybe something could be built out of fiberglass, and have a mounting system that will withstand the car wash.